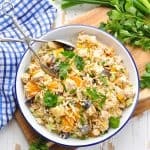 This light Southern Chicken and Rice Salad is a satisfying dish that's perfect for easy summer dinners or a fancier lunch with the ladies. The marinated chicken, sweet fruit, crunchy almonds, and hearty brown rice, offer a variety of flavors and textures for the ultimate crowd-pleasing dish! In a small bowl, whisk together oil, vinegar, and orange juice. Season chicken with salt and pepper, and place chicken in a large zip-top bag. Pour marinade into the bag and gently toss to coat chicken. Marinate chicken in the refrigerator for at least 1 hour (or up to overnight). Heat 1 tablespoon olive oil in a large skillet over medium heat. Place chicken in the skillet and allow the chicken to cook on one side, undisturbed, for at least 4-5 minutes. Flip, and cook the chicken for about 5 more minutes, or until it is nicely browned on both sides and cooked through. The chicken is cooked through when the internal temperature reaches 180 degrees F, or when juices run clear. When the chicken is cooked through, remove it from the skillet and place it on a cutting board to rest. Once chicken has cooled to the touch, diced into bite-sized pieces. Place diced chicken in a large bowl. Add pineapple, oranges, celery, and grapes. Fold in cooked rice. Add mayonnaise and sour cream; season with salt and pepper, to taste. You can stir in additional mayonnaise, as needed, to reach desired consistency. Stir in almonds just before serving. Garnish with fresh parsley. *For a shortcut, use a store-bought rotisserie chicken. You can skip the marinating and cooking, and just use 3 cups of cooked, diced chicken! **For another shortcut, I used microwaveable cups of Minute Rice. ***I used light mayonnaise and non-fat plain Greek yogurt for purposes of nutritional information. Any type of mayonnaise, Greek yogurt, or sour cream will work fine! Cooking Just for Two? You can cut the ingredients in half to prepare a smaller salad for a smaller group! Cooking instructions remain the same.